Remasters & I have a tormented relationship in which I can't decide if I dislike them or not. On one hand gamers are paying for the same experience because they have a fondness for a game, and on the other hand, new gamers are getting to experience a game that is looked at fondly for the very first time. The Bioshock series as a whole doesn't really fall under the classic banner for me if I'm being honest with you all. While I loved playing through both the original BioShock and also BS Infinite back on my 360, BioShock 2 slap bang in the middle of them both did nothing for me at all. The Bioshock Collection offers current-gen console owners the chance to dip back into the underwater world of Rapture of BioShock 1 & 2, while also letting you take to the skies of Columbia in BioShock Infinite. All DLC is bundled in with this too, with the only thing missing being the MP saw in BioShock 2, which if you never played it the first time around it isn't that much of a loss. With the first Bioshock game releasing way back in 2007, it was always going to be here where the remaster would be more noticeable, with me last unlocking an achievement for the game way back in September of that year. 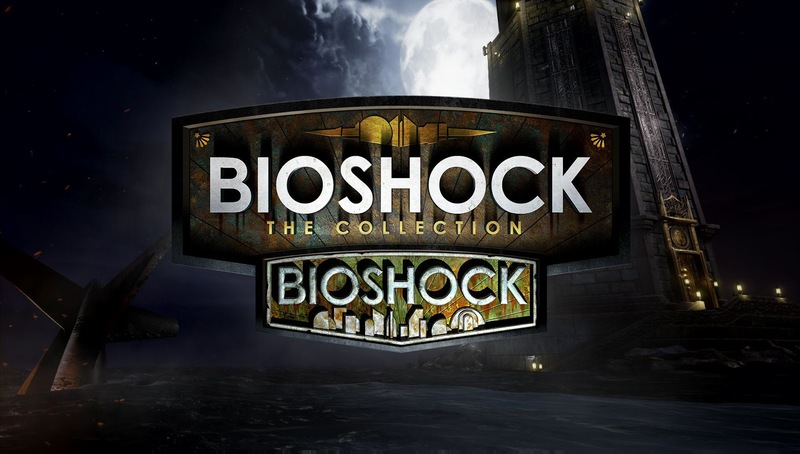 The release of Bioshock 2 soon followed after the success of the first game with it coming out in 2010, and Infinite soon followed after that, with it coming out in 2013. In the first BioShock, you play a character by the name of jack, who discovers the underwater world of Rapture after the plane he's on crashes into the ocean and he explores a singular lighthouse the plane just happens to crash by. Once inside this lighthouse you come across an underwater pod, which once it reveals Rapture to you, sees you following the words of a guy called Atlas, a man in search of his wife and kids. From here on in your told why Rapture went downhill thanks to a drug known in the game as ADAM, which while not wanting to ruin the rest of the game for you, just know that this ADAM plays a key role in your character growing and becoming more powerful, thanks to this ADAM being the main ingredient in what becomes you secondary weapon known as a Plasmid. Loading up the original BioShock for the first time in close to 9 years brought back a ton of memories, none more so than the first time Rapture is revealed to you in the game. It's an iconic moment, and one I was blown away with when it first came onto my TV screen all those years ago. Getting to experience it again but now in HD and on a bigger TV (I was poor back then), while not having the shock and awe it had back then in 2007, it was still a pleasure to sit through and look forward to what was coming as I played through the game. In terms of BioShock looking any different from when I last played back on my 360, I honestly couldn't give you a definitive answer. Does the game still look good and stand up to anything present day? Yes, it does. 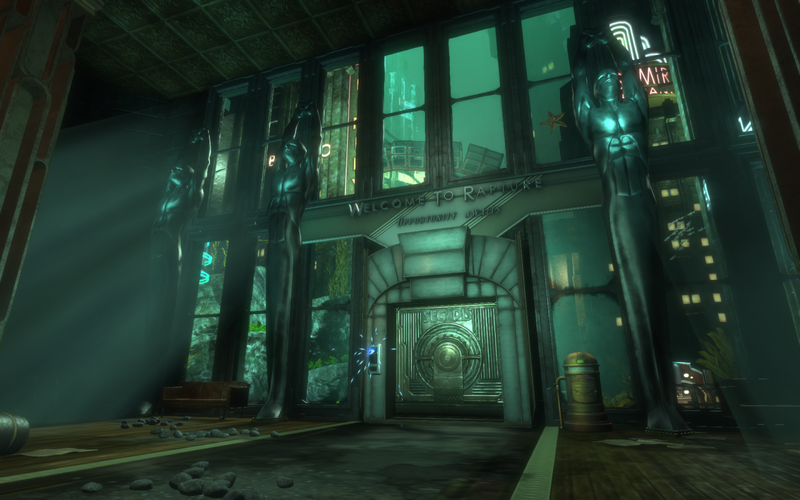 Sure a few things like the combat system have aged a bit now, but the story and adventure that BioShock offers is still there to enjoy and take in, as even if you're back visiting Rapture once again, or this is your first trip into this crazy underwater world, BioShock still has a lot to offer. BioShock 2 looking just as nice as BioShock does on this remastered version, decided to mix things up a little with you playing the role of the iconic Big Daddy this time around. Once again taking place in Rapture, it sticks closely to what the first game offered, but this time offering a few tweaks. None more so than having a massive drill on your arm to kill enemies now. For whatever reason, I still see this game as the weak link, but none the less it's there with DLC and all for you t enjoy the whole trilogy. 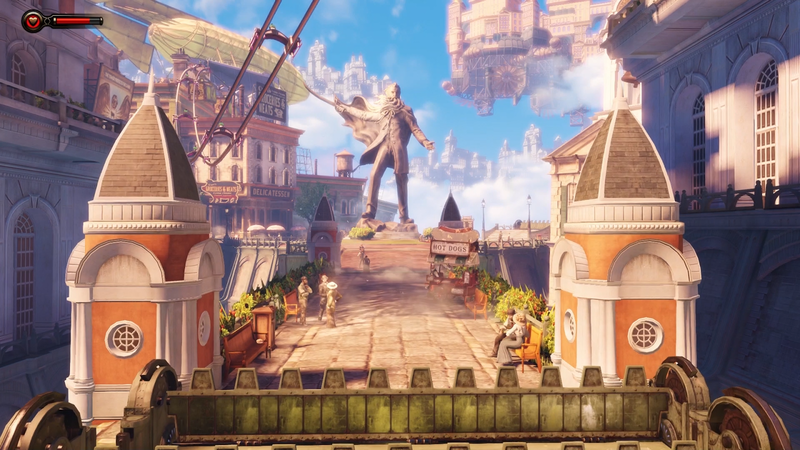 BioShock Infinite is perhaps the most pointless game of the whole collection, but not because it's rubbish, as once again it had real moments where you just sit there open-mouthed in awe. The downside to Infinite is it's just too close to the original release that nothing could warrant me to say that this is worth you paying for again so soon if you played the original. With BioShock 1 & 2 I found myself not remembering the smaller details of the story as I played through them with this version. But with this still being fresh in the mind (much like the Tomb Raider and Rayman remasters we saw not long ago) the only reason to play through this again so soon would be because all the DLC comes with this version, and/or you want those achievements a second time around. The game itself was already a beautiful game to begin with, so of course it still looks gorgeous even now. Does it warrant a re-release so soon? Perhaps not. The one thing I wanted to touch upon briefly when typing up this review is something I've only noticed by being able to enjoy the series for a second time, and that's the audio. Back when playing the series on my 360, I never had a decent headset that allowed me to take in the sounds of BioShock and how much it adds to the game. Playing this collection now I've found myself jumping at moments that did nothing to me when playing the originals all those years ago, and just enjoying this part of the game for the first ever time. Even when all you're doing is exploring what the games have to offer, it does a great job at throwing noise at you, so you really don't know what to expect around every corner. It also turns BioShock 1 at least into a more scarier game than I had remembered it as. Do yourself a favour when you do play this, play in the dark and with a headset if you want the best experience. Overall: BioShock is without a doubt a game that will be looked upon in years to come as one that offered many iconic moments in gaming. Things like the first time we see Rapture, the first time we float down in Columbia, the first time we see a big Daddy, the first time we have to choose if we should harvest or rescue a little sister. These are all great moments that are now available for a new audience. Those going back into the game a second time will once again get to enjoy the whole series in one great package. If you can pick this up for about £30.00 somewhere on the net, then I would happily say you have got yourself a great deal.